Dramatic louverless construction gives the fireplace a clean, traditional masonry look and provides the ability to finish right up to the opening. Tall ceramic-glass opening provides an exceptional view of the logs and flame. The high-definition charred split-oak log set is cast from real wood for an authentic look. Platinum embers enhance the glow of the fire. Light and dark-tinted outdoor kits trimmed in stainless steel are available for indoor/outdoor application. The dark-tinted version provides enhanced ambiance from inside the room by creating an infinity effect while reducing glare from the outside environment. Exclusive Secure Vent(tm) chimney system provides efficient venting. Rated 68% in annual fuel utilization efficiency (AFUE). An outdoor conversion kit allows the unit to be installed into an outside wall. The kit includes components to weatherize the exterior of the fireplace. An adjustable air shutter is included in the burner which allows you to raise or lower flame height to desired levels. A required choice of liners available in Buff Rustic, Buff Herringbone and Black Porcelain. Optional andirons evoke the look of a traditional hearth, in Mission and Classic styles. Decorative freestanding screens in a variety of designs are available. Available in power-vented versions which can vent up to 110 ft.
Can be installed as an indoor/indoor unit or as an indoor/outdoor unit with the addition of an outdoor kit. * Please Note: If unit is being installed with one side viewing the outdoors, a separate purchase of an outdoor window kit is required. Outdoor window kits for this unit can be found under the "Accessories" tab on this page. Tired of searching for all the requirements when looking for a fireplace? Look no further, Superior is the brand to use. Superior provides customers with the best of fireplaces. 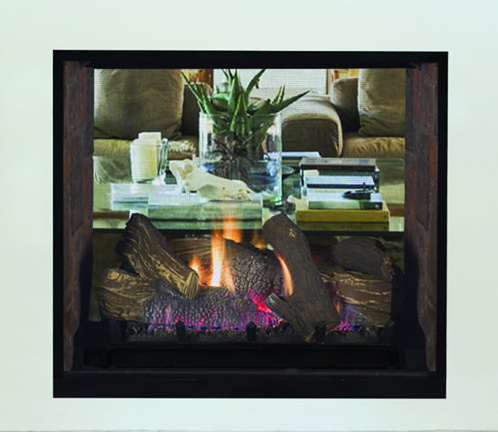 One model, the DRT63ST signature series top vent see-thru fireplace is one of the more popular models. Superior offers customers with the choice of natural gas or propane when it comes to fuel. The liner kit comes in either black porcelain, buff herringbone ceramic, or buff rustic ceramic. This realistically stunning fireplace features an expansive two-sided opening and is available in a 40" size. Completing this fireplace is the fact that it comes with logs, a ceramic ember bed burner, log grate, and wire mesh pull screens. What are the dimensions of the viewable area of this fireplace in length and width? The glass viewing area is 34-3/4" wide by 29-19/32" tall. Can you drywall up to the edge of the opening of this Superior DRT63ST Signature series 40" top vent see-thru fireplace just like the photo shows with stone? Drywall can be used up to the edge of the fireplace chassis, but it cannot overlap it. The chassis has a side bar on either side that is approximately 6 inches wide, covered by stone in the photo. Those side bars can only be covered with a noncombustible veneer. What are the rough-in dimensions of this Superior DRT63ST Signature 40" top vent see-thru fireplace? The framing dimensions of this unit are 52 1/16" wide, 47 5/16" high, and 26 5/16" deep.